1. At the top of your Dixa account, click on the channel that you want to accept conversations from. 2. Set your presence to working/away by clicking the small icon next to your avatar picture. Or you can click on the drop down arrow to the right, and change your presence by clicking the small button to the right. 3. Click on Ring Mode if you want to activate simultaneous ring. 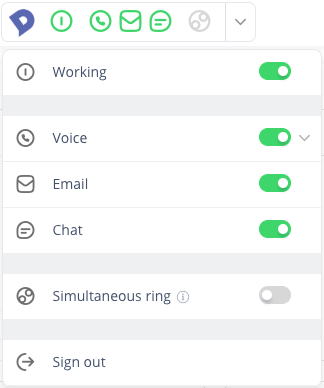 When simultaneous ring is activated, calls are offered both in the Dixa interface and the phone number you have added in your profile. To activate simultaneous ring you first need to save a phone number under Profile. How Do I Receive Calls On My Mobile (Simultaneous Ringing)?